When the then 25-year-old Johnny Logan stepped on stage at the Grand Prix d’Eurovision in Den Haag, the spectators hadn’t yet realized, that they would be experiencing a future superstar. With the mega hit What’s Another Year the sympathetic Irishman sang himself directly into the hearts of a million-public and turned into the swarm of a whole generation, over night. In 1987 he managed what no artist had ever managed before him: he won the desired trophy anew in Brussels, with the song Hold Me Now, which turned him into a legend. The power ballade – composed by Logan himself – reached 2nd place in the UK Single Charts and was sold, worldwide, over six million times. In 1992 Johnny Logan won the Grand Prix for the third time, as the composer of the song Why me, sung by Linda Martin. But Johnny Logan is far more than a Eurovisions-Icon. The exceptional singer and composer has shown world format with numerous other songs and albums of Evergreen quality and considerably influenced the pop scenery. More than 500 million spectators viewed his Grand Prix victories worldwide – an impressive basis for Johnny Logans further musical career. But still only a basis from which Johnny Logan consequently and, unimpressed by the broad media presence (eleven performances at Top Of The Pops and more than 40 performances on television a year), developed his art and established himself as a singer. Johnny Logan was born in 1954 as Sean Patrick Michael Sherrard in the Australian Melbourne. His father Patrick O’Hagan was an irish star tenor, who was allowed to perform in the White House three times on the line of his career: for John F. Kennedy, Lyndon B. Johnson and Richard Nixon. When Johnny Logan was three years old, the family moved to Ireland. At the age of only twelve, Johnny accompanied his father on tours to Australia and New Zealand. To pass time when they were on tour, father and son sang together in the changing rooms of the large concert halls. This time had a forming influence on Logan and strengthened his wish to become a musician as well. At the age of 13 he learned to play the guitar and wrote his first songs. The rest is history of music. Johnny Logan did not only perform for Pope Johannes Paul II, Queen Elizabeth and Prince Phillip, but also appeared with the top of the international music industry such as Montserrat Caballé, Helen Shapiro or the Royal Philharmonic Orchestra. Ever since, the number of his projects reflects his diversity, which covers every colour and style of music – from Irish Folk over hits to songs and soundtracks for TV-series and movie films -. Johnny Logan always stayed true to his music and to himself. 28 years after his first won Grand Prix, Platinum honours and sold out concert tours prove, that quality implements and that hand made music has no sell by date. 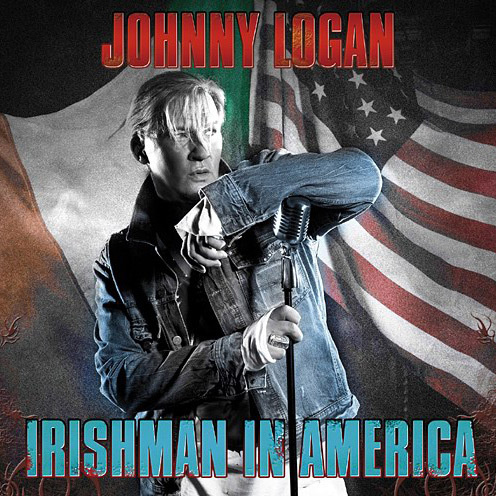 On his new CD Irishman In America, Johnny Logan returns to his musical roots. Twelve great songs between Irish Folk, american classics and grand pop melodies impressively demonstrate the process of an exceptionally talented musician – an album that can be placed in the long line of Johnny Logans great success without a problem. The boy’s won’t leave the girls alone. Well that’s alright till I go home. She is handsome. She is pretty. She is the bell of Belfast City. She is courtin’ one, two, three. Albert Mooney say’s he loves her. All the boy’s are fighting for her. Sayin’ “Oh my true love, are you well”? Rings on her fingers and bells on her toes. She’s as nice as apple pie. She’ll get her own lad by and by. She won’t tell her Ma when she gets home. For it’s Albert Mooney she loves still. closed my eyes; saw the silver in your hair. you were always’s at my door. i go dancing with my father through the streets of yesterday. through the halls of laughter. that hold’s a promise, we’ll never be apart. An’ didn’t I give you nearly everything that a woman possibly can ? I’ll say come on, come on, come on, come on, yeah take it! Have another little piece of my heart now, baby, yeah. Wasn’t much in vogue on the rocky road to Dublin. Now I don’t mind choppin’ wood, and I don’t care if the money’s no good. Will ye come to the waxies dargle? Sure I havent got a farthing. What are ye having, will ye have a pint? Well be thrown out of the boozer. Will ye come to the galway races? With the price of my aul lads braces. Youll know you have died of hunger.